Craving milkfish? 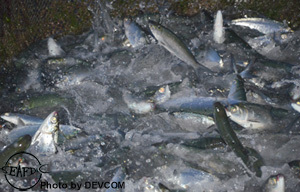 SEAFDEC/AQD is harvesting milkfish this Friday (10 May 2013) from its Dumangas Brackishwater Station, Iloilo. The milkfish is priced at Php 90 per kilo. To order, please call AQD’s Materials Control Unit at (033) 511-8091 or (033) 511-9171 loc 320.